With the rain we have had this year, our harvest is plentiful! I have traditionally purchased disposable canning lids, the metal ones that once you pop them off the jar you can't reuse them. This makes for a lot of waste! I was very excited to try out Tattler Reusable Canning Lids this year while I canned Pear Sauce. 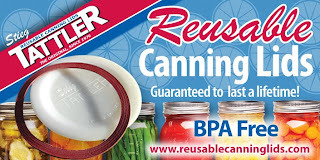 The lid comes in 2 pieces, the plastic top and the rubber insert, so when you pop the lid off the canned jar, you aren't bending the plastic and disrupting the rubber. The rubber is latex free and made from a food grade nitrile rubber.They are reusable again and again. You will have to purchase the metal bands to go on the outside of the jar, but those are already reusable. I didn't have any trouble with them sealing at all. Every single one of them in the hot water bath sealed. You can also use them for your pressure cooker canning needs. When I have tried to reuse the metal lids I have always had some not seal, even if I looked over them carefully. They just aren't made for reuse. Tattler lids will last a long time! The only part that may wear out is the rubber component and you can purchase those separately. 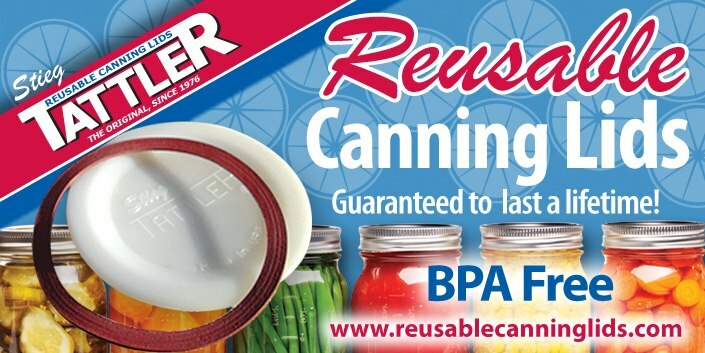 Many reviews mention using the Tattler Canning lids for years without having to replace the rubber gasket.